January 31, 2019 – The Hundred Days campaign (August 8 to November 11, 1918) contributed decisively to ending the First World War. One hundred years later, the Canadian War Museum concludes its commemoration of the First World War Centenary with “Victory 1918 – The Last 100 Days”. The exhibition remains open until March 31, 2019. 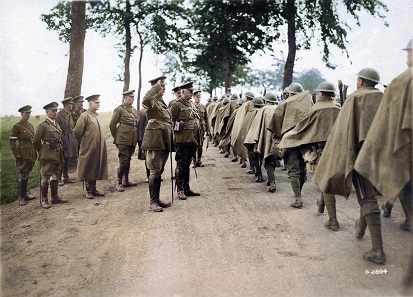 General Mewburn and Lieutenant-General Currie with marching soldiers, August 1918. Image colourized by Canadian Colour. Photo: George Metcalf Archival Collection, Canadian War Museum. Developed by the War Museum with the generous support of John and Elizabeth Irving, the exhibition is a powerful and evocative exploration of the critical role the Canadian Corps played in the series of battles that led to the Allied victory. Nervous soldiers waited in silence before the battle on August 8, 1918. In a few hours, they might be killed or wounded. Watches were synchronized for the zero hour: 4:20 a.m. 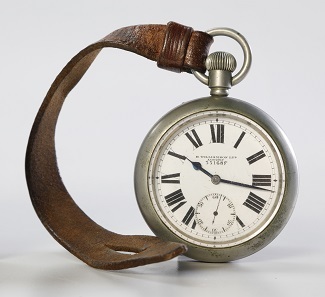 This watch was used by Private Charles John Cook. Photo: Canadian War Museum. 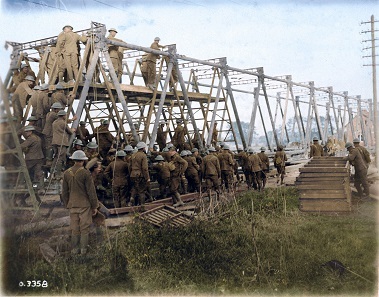 By 1918, the Canadian Corps had developed a robust engineering capacity to support the infantry. Twelve engineering battalions built roads and bridges, found water supplies and cleared enemy-laid explosives. The attack at the Canal du Nord could not have succeeded without the bridges that allowed artillery and tanks to cross the divide. Image colourized by Canadian Colour. Photo: George Metcalf Archival Collection, Canadian War Museum. Curated by Dr. Tim Cook and Dr. Jack Granatstein, two of Canada’s best-known military historians, this new exhibition weaves artworks, artifacts, documents, film and photographs together with the powerful stories of Canadians who participated in this costly combat. Nursing Sister Lillian Ellen Galbraith, from Barrie, Ontario, was a pre-war nurse who served in several hospitals and medical units in Malta, Britain and Salonika, Greece. Galbraith was one of almost 3,000 Nursing Sisters who cared for the wounded during the war. For her long service from 1915 to 1920, she was awarded the rare distinction of the Royal Red Cross, Class 2 medal. Photo: Tilston Memorial Collection of Canadian Military Medals, Canadian War Museum. Visitors can follow the Canadian Corps through a chronological series of battles in France: Amiens (August 8 to 11), Arras (August 26 to September 2), Cambrai (September 27 to October 9), and the final drive ending in Mons, Belgium (October 10 to November 11). The final section explores the soldiers’ return to Canada and the legacy of the war. This 18-pounder Canadian artillery piece was used by the 39th Battery, Canadian Field Artillery during the Hundred Days campaign. 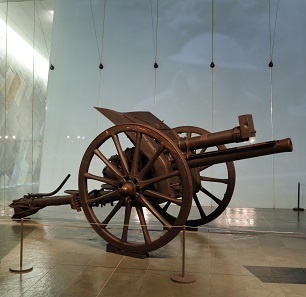 In August 1919, Canadian soldiers presented it to the citizens of Mons, Belgium as a symbol of friendship, claiming that it was the last Canadian gun to fire before the Armistice. 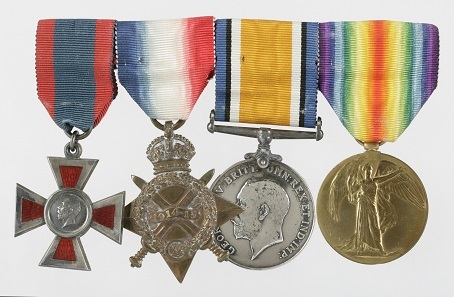 Photo: City of Mons Collections. The exhibition also includes educational programming in the Eaton Activity Hub, where visitors are invited to explore the evolution and success of military tactics through interactive elements and guided activities. 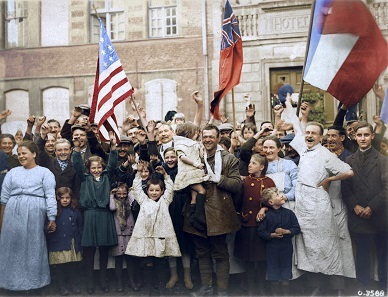 With the Germans retreating, the Canadians liberated dozens of French and Belgian towns and cities. They were greeted with relief and gratitude by thousands of civilians who had suffered under German occupation for over four years. Image colourized by Canadian Colour. Photo: George Metcalf Archival Collection, Canadian War Museum. Each battle is presented through personal artifacts, evocative reconstructions, compelling images and archival footage. Newly colourized photographs and archival films, along with compelling audiovisuals and soundscapes, bring fresh life to the faces of war. For more information on this exhibition, please visit the Canadian War Museum website. A short trailer is also available online.